The Escape Fitness power chains allow a higher intensity of many fitness exercises. 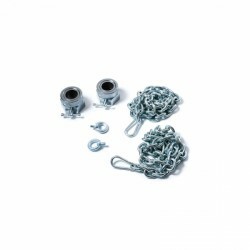 The additional load of the power chains produces a higher training load and a more demanding training. Weight chains do not only give a fresh impetus to the basic exercises of the classic strength training but also show you completely new options to build muscles effectively. Weight chains can be used as independent training equipment. They are also an optimal, versatile addition to your existing strength equipment. The training with weight chains is a progressive strength training. While using the weight chains throughout the workout, there is a progressive load for every repetition, which demands a maximum challenge from you throughout the whole phase of the movement. At the same time, the load on the joints is minimised during the single phases in contrast to classic strength training with heavy weights. While doing the exercise, the weight chains do not only demand the few big muscle groups but also strengthen the core muscle more effectively due to their light swinging. Due to the use of many different muscle groups, it results in a stronger inter-muscular coordination, which requires a clean training movement. Due to this increased load during the training, the training becomes more effective and you need less time to achieve your training targets. Weight chains have been developed so that they are made of materials of highest quality (i. e., alloy steel) and can hence withstand easily highest and permanent loads and guarantee the user a long lasting fun to exercise.